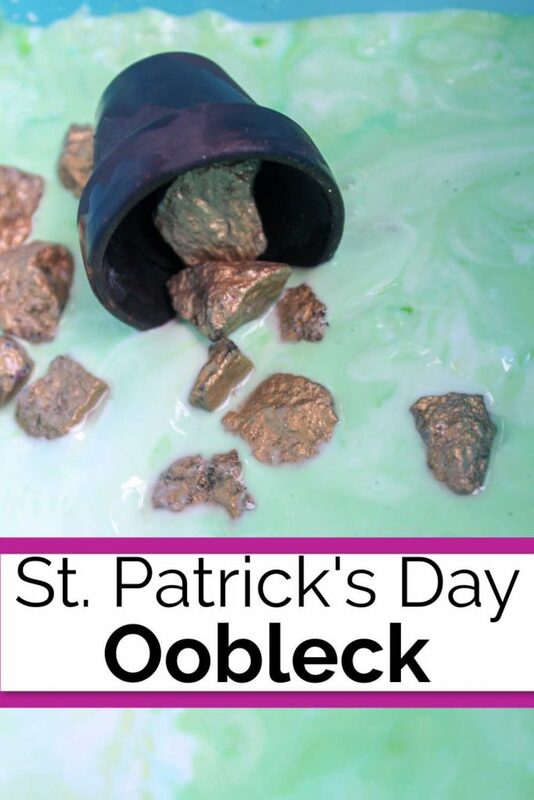 This pot of gold St. Patrick’s Day themed oobleck is perfect for young children to engage in play-based learning. 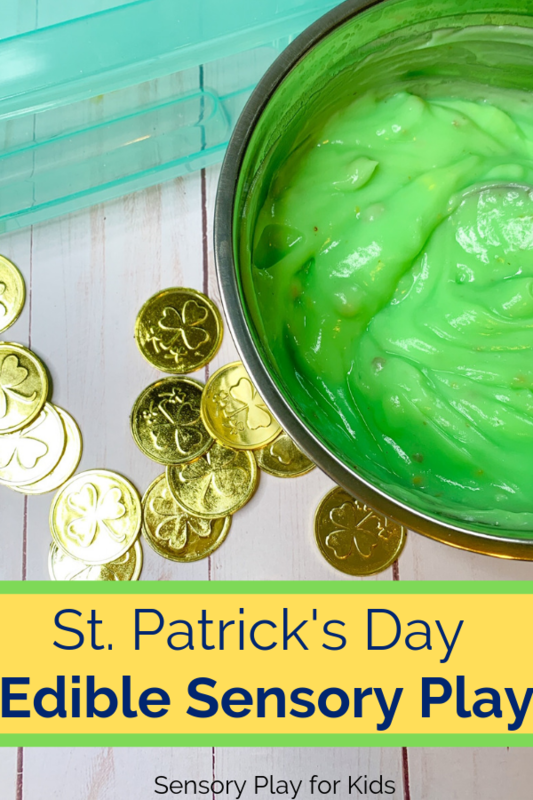 The gold rocks and pots of gold add a fun dimension to a classic oobleck recipe. Yesterday, my kids had a sensory play-filled day. First, we went out and played in the forest. They threw rocks, stomped in mud puddles, and splashed in the river. Then, we made St. Patrick’s Day themed oobleck. And finished off and cleaned up by making soap foam. The St. Patrick’s Day themed oobleck had them squealing with joy and playing for over an hour. This morning, my two-year-old headed outside to play with the oobleck again. can have essential oils (like peppermint) added to it. Paint rocks 1-2 coats of gold paint on rocks. Mix water and food colouring. 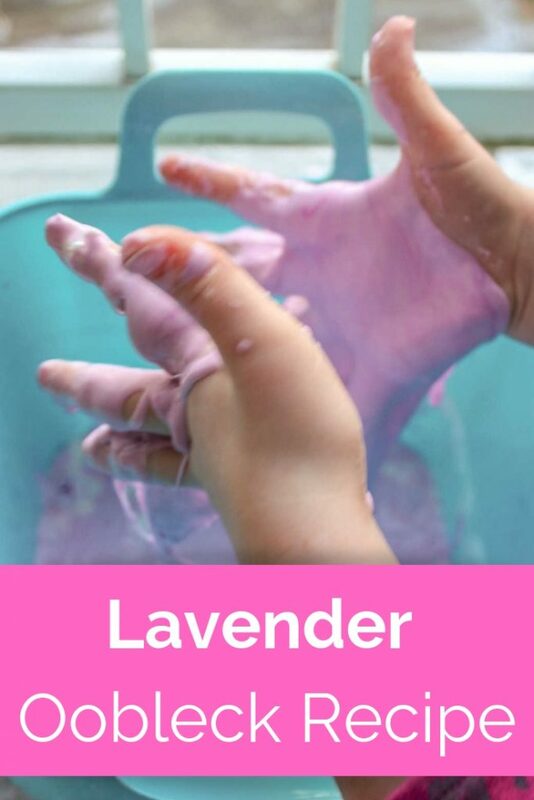 Add coloured water to cornstarch. Add gold rocks and pots. 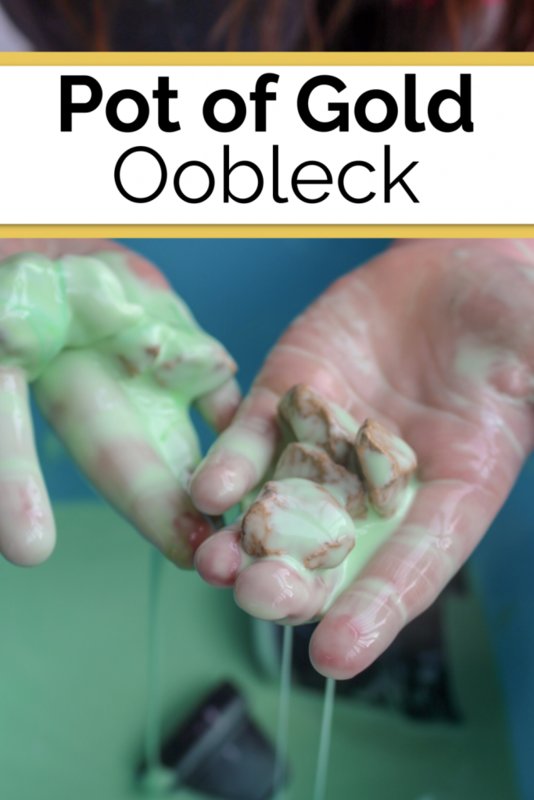 Store oobleck in an airtight container. Add water if it has started to harden. It can be kept in a fridge and reused for months. When we made this, I had a warm bowl of water and a towel nearby. The clean up was easy. 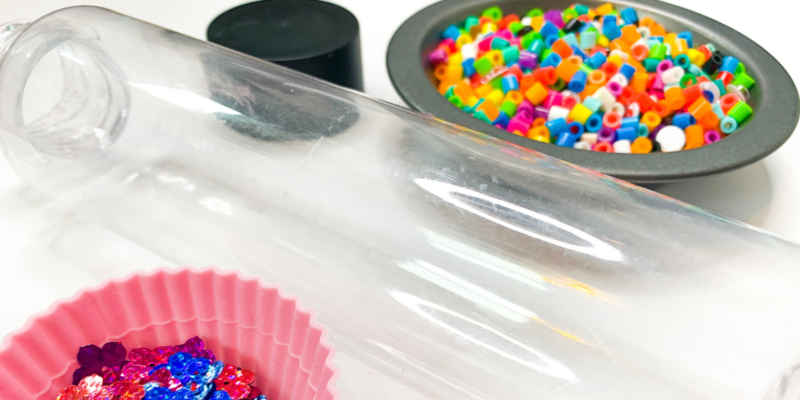 Find out how to make the best glitter slime recipe. It’s fail-proof and such fun sensory play. Plus there’s a fun add-on for St. Patrick’s Day. Click here to see more. This digging for gold edible sensory play set up is perfect as a St. Patrick’s Day activity for kids. Baby-safe edible play is so much fun! Click here to learn more. 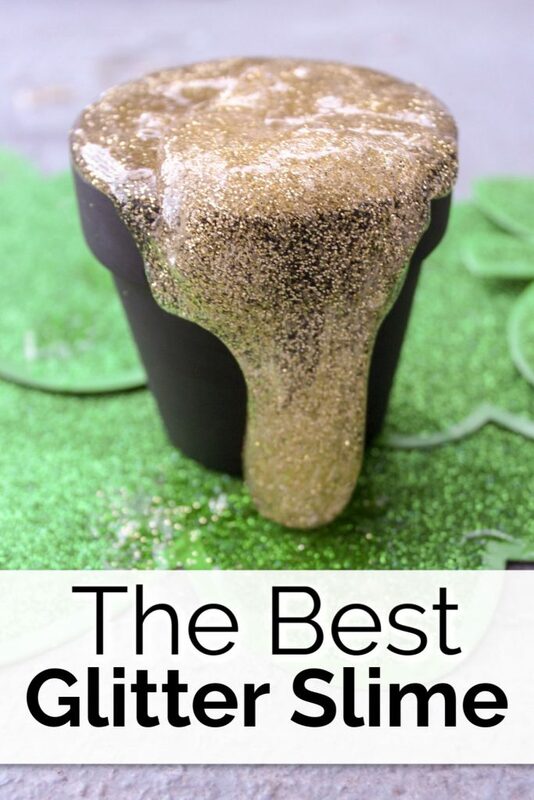 This shamrock slime uses a gold slime base with an addition of green glitter. 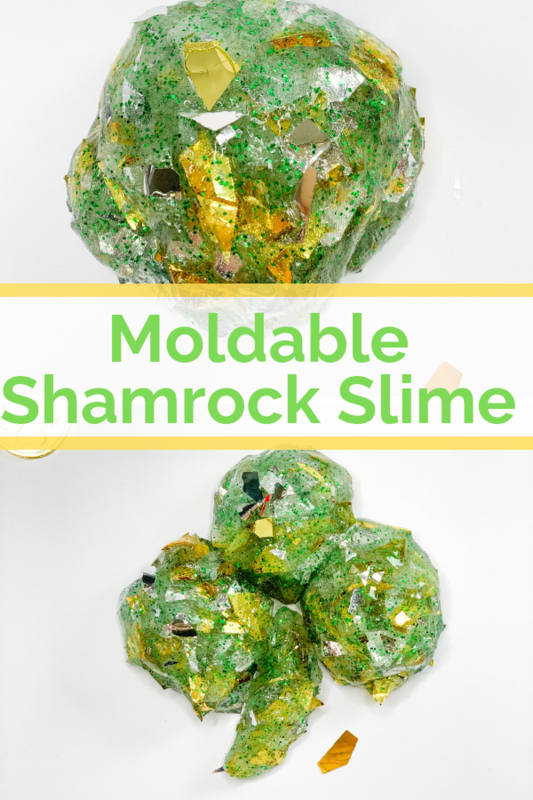 Adjust the recipe to make the slime moldable and kids can make shamrock shapes. Click here. We hope you enjoy these St. Patrick’s Day themed activities as much as we did. 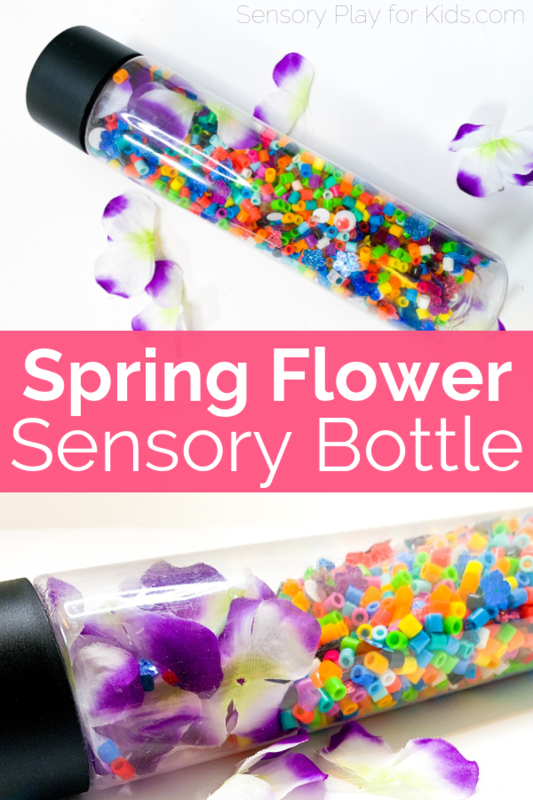 Such a simple and colorful Spring flower sensory bottle perfect for sensory play with babies and toddlers. Perler beads and silk flowers make this beautiful. 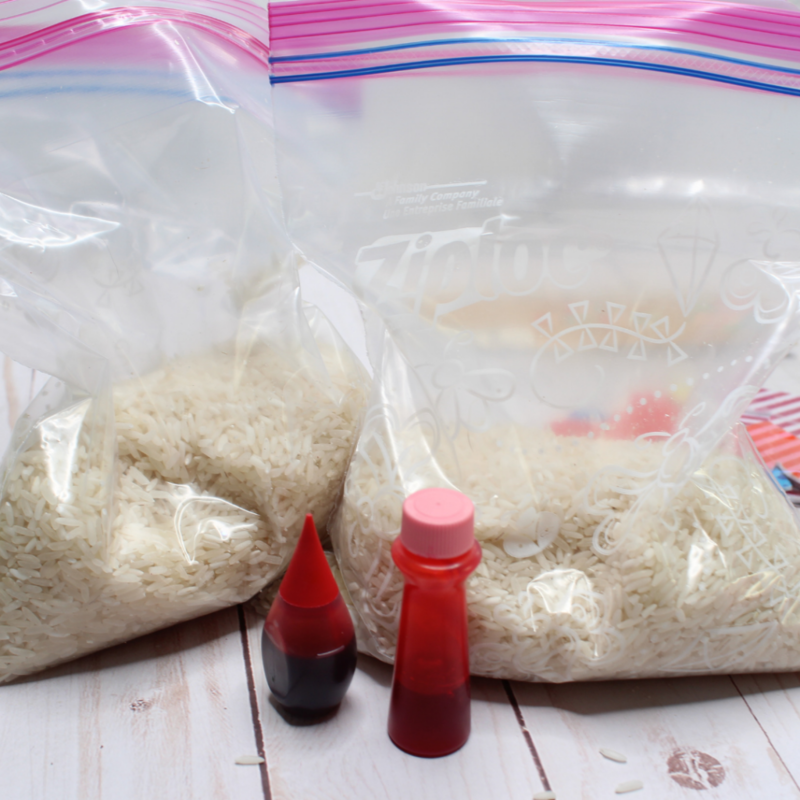 Sensory bottles make excellent activities for babies and toddlers. They are a mess-free way to engage in sensory play with this age group, while still stimulating senses such as sight, touch and sound. 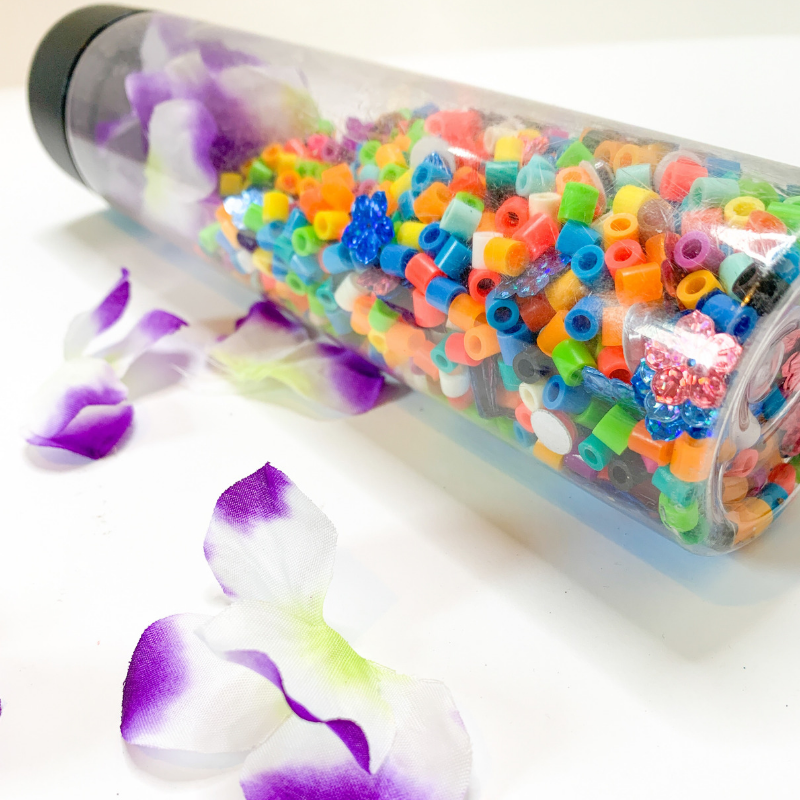 This Spring flower sensory bottle is beautiful to look at, and fun to listen to. The sound of the beads falling around the plastic bottle sounds a bit like rain on the windows. Additionally, toddlers will love to shake this one around, making music! Wash and dry the plastic bottle before use. 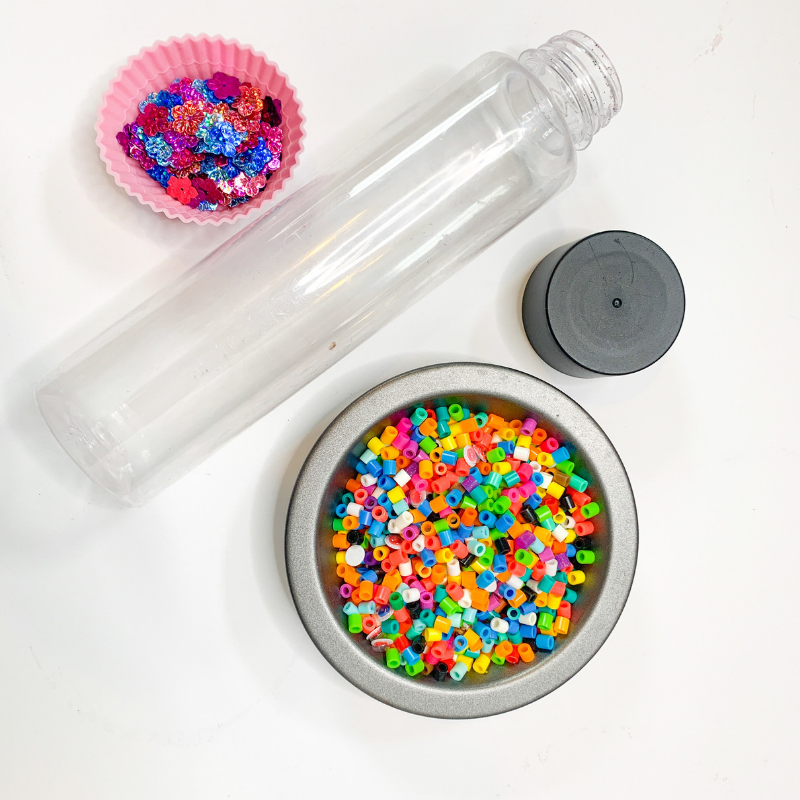 Using a funnel, pour the perler beads into the empty bottle. 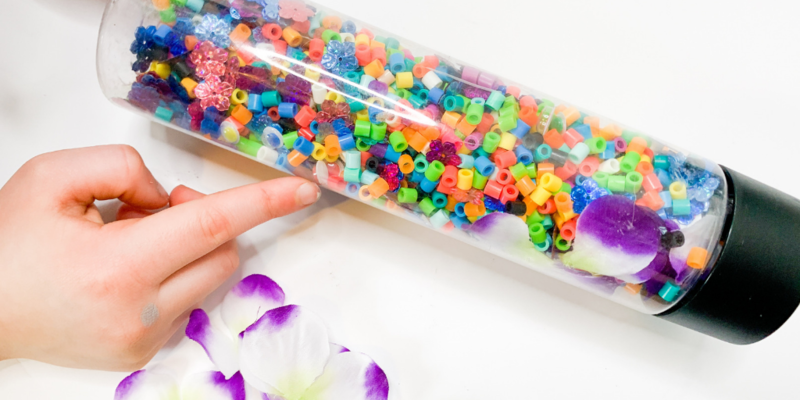 Fill about halfway with the beads so that there is plenty of room to move about the bottle, this will create a fun sound for little ones. 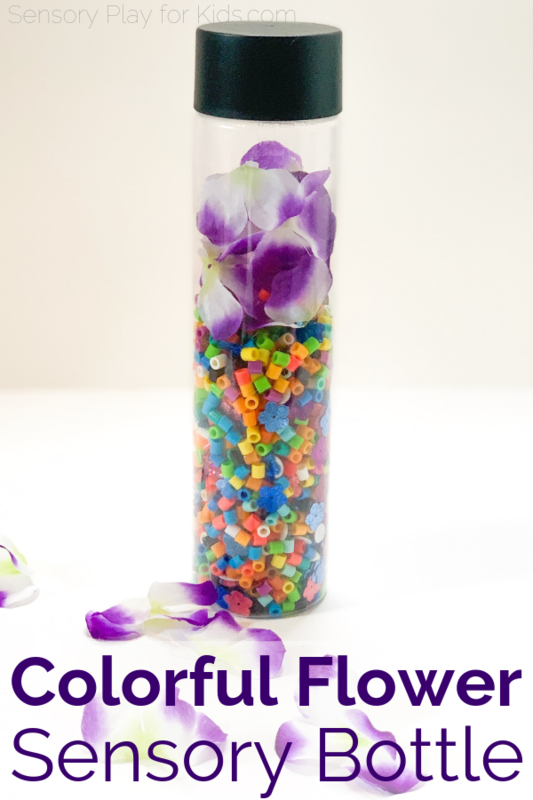 Add the flower confetti and shake to mix. To the top of the beads, place some silk flowers. Secure the top of the bottle by hot glueing the cap so that they small beads don’t fall out posing a choking hazard for babies. 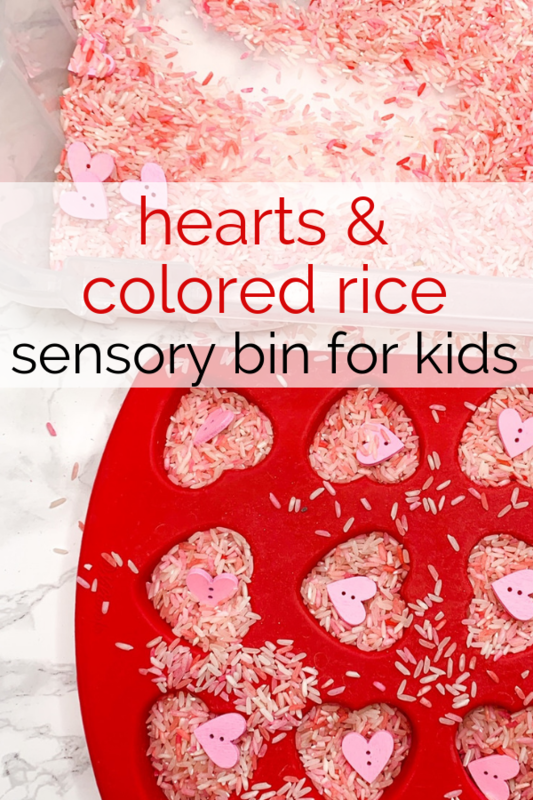 Kids can roll this around or shake it up, either way, it’s such a fun sensory activity for kids! This is such a fun sensory bottle for babies, but older kids love sensory bottles as well! 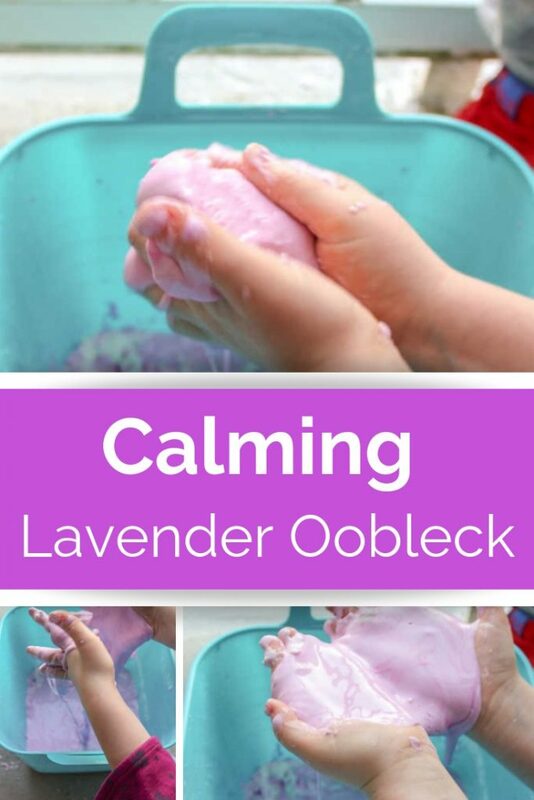 These make excellent calming tools for older children. Watching beads or items fall around a bottle can have a mesmerizing and calming effect. Included in our calm down area are sensory bottles of all types, and it’s always a first choice for my kids. 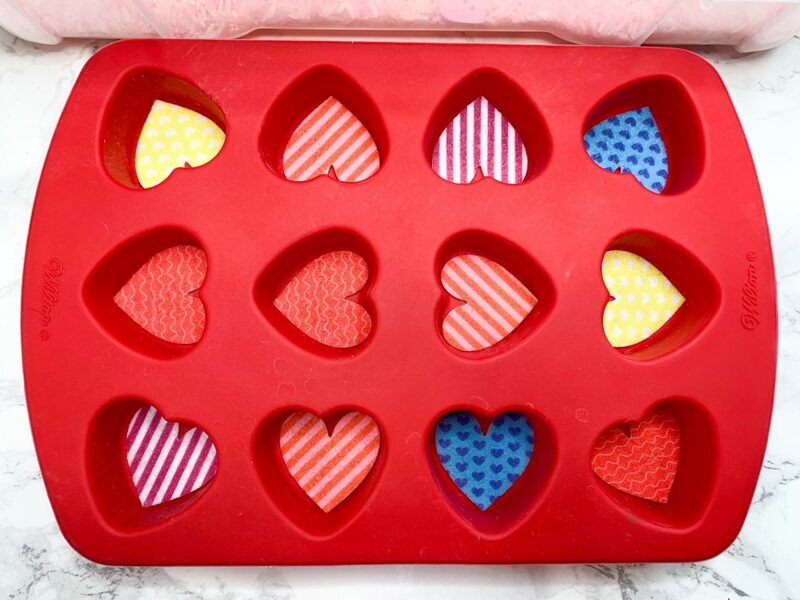 In addition to being used as a calming tool, they can be fun for a game of I-Spy. Children can shake the bottle and inspect the contents to find hidden objects. 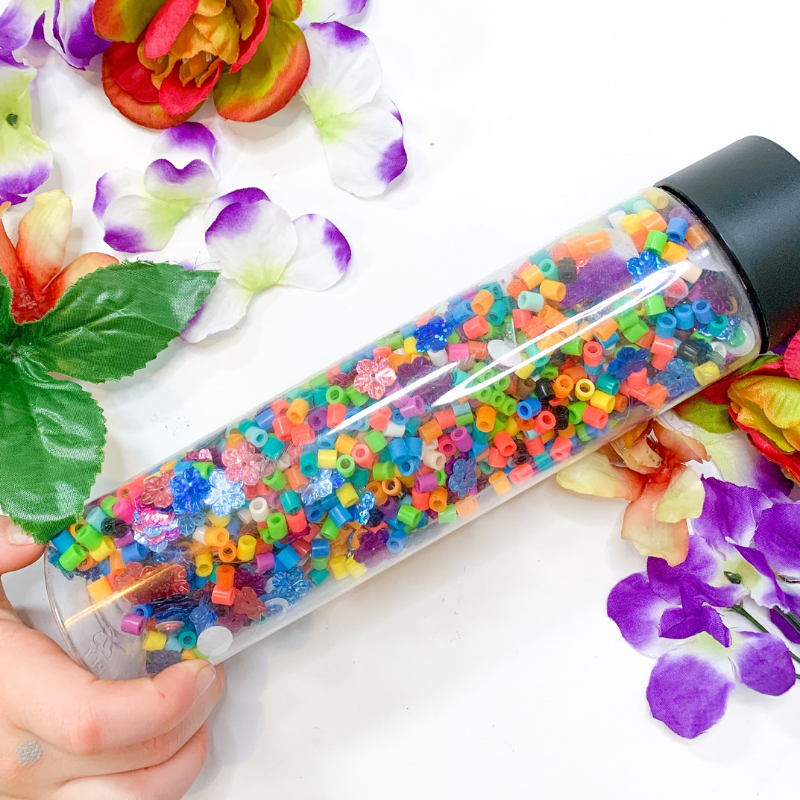 With this sensory bottle, kids can shake the bottle, and hunt for the flower confetti, counting the number and color of flowers found with each shake. 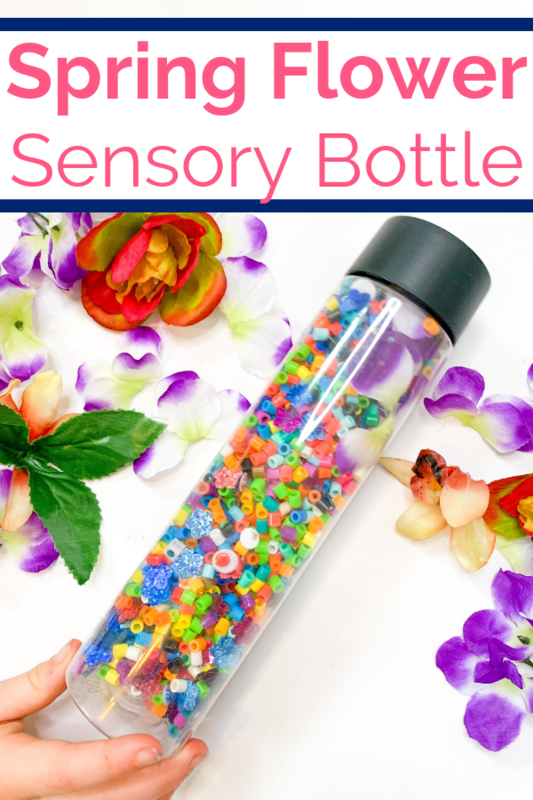 Have so much fun with this Spring sensory bottle perfect for kids! 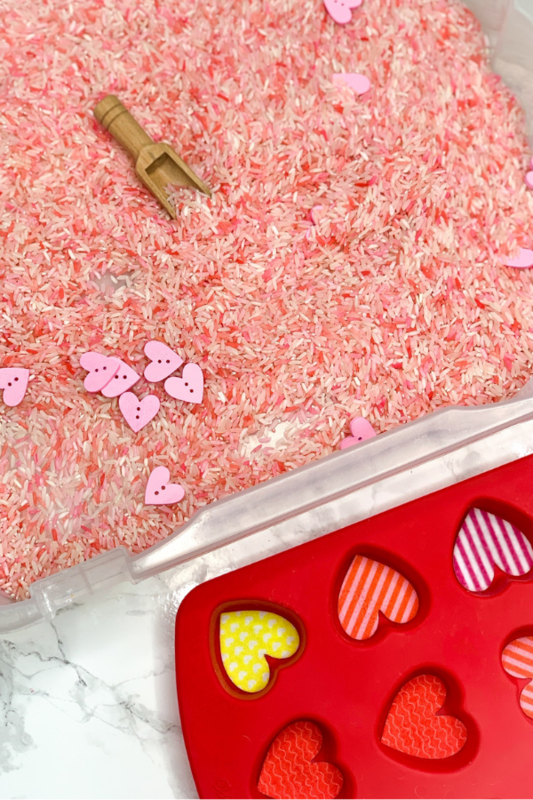 Find out how to make the best glitter slime recipe. 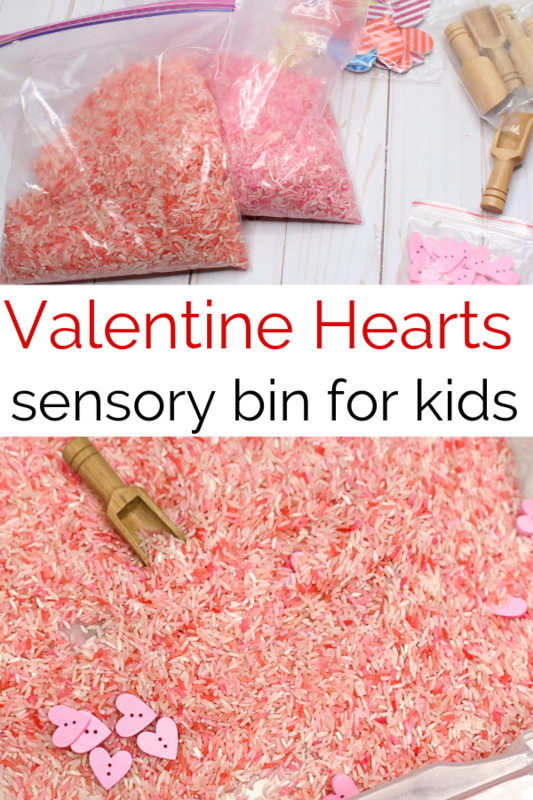 It’s fail-proof and such fun sensory play. Plus there’s a fun add-on for St. Patrick’s Day. My daughter loves all things glittery and gold. So when she came home after school, I had an idea. 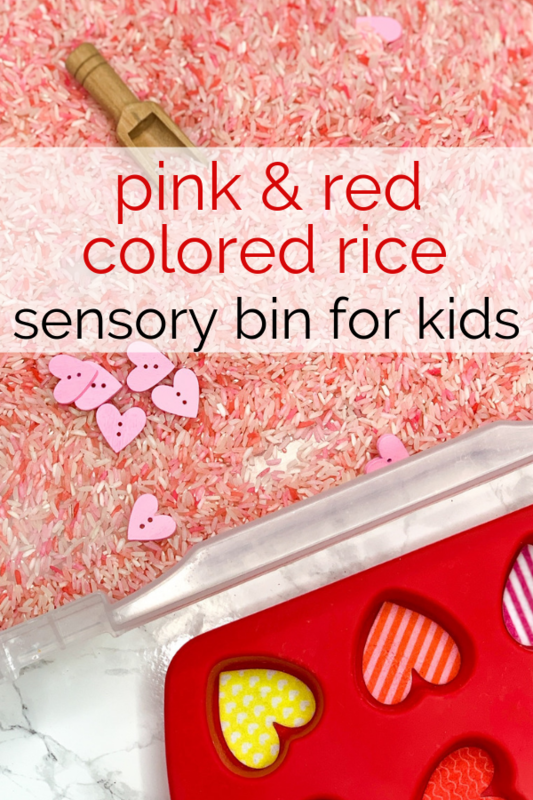 One of our favourite ways to unwind and avoid after-school meltdowns is through sensory play. 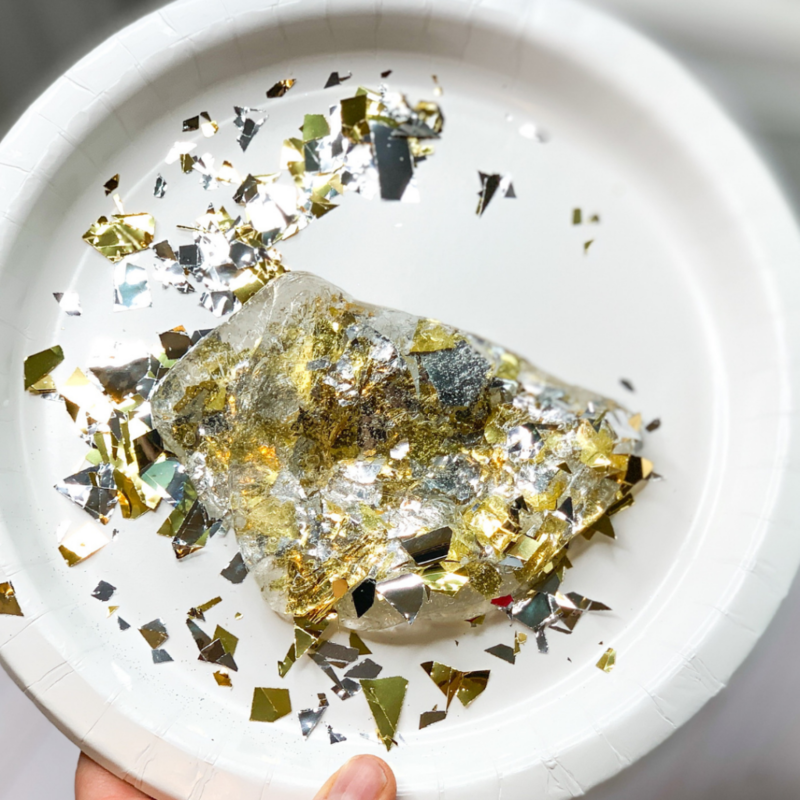 After all three of my kids played with foaming soap, we decided to try our hand at making gold glitter slime. My daughter was so excited to make something beautiful. We encountered two slime fails before perfecting the recipe. First, I tried making gold slime using this vibrant gold acrylic paint we have. Because white school glue is less temperamental than clear glue when making slime, I tried combining white glue and gold paint. The result? Dripping, gross tan looking slop. Take two, I tried clear glue with acrylic paint and it just looked weird. Take three was… well perfect. My daughter said this is the best slime we’ve ever made. And, it’s gorgeous. (if ever you’ve made clear slime before, you know how easily it can go wrong). Use equal parts water to clear glue. Mix the glitter before adding the activator. Add the activator very sparingly. 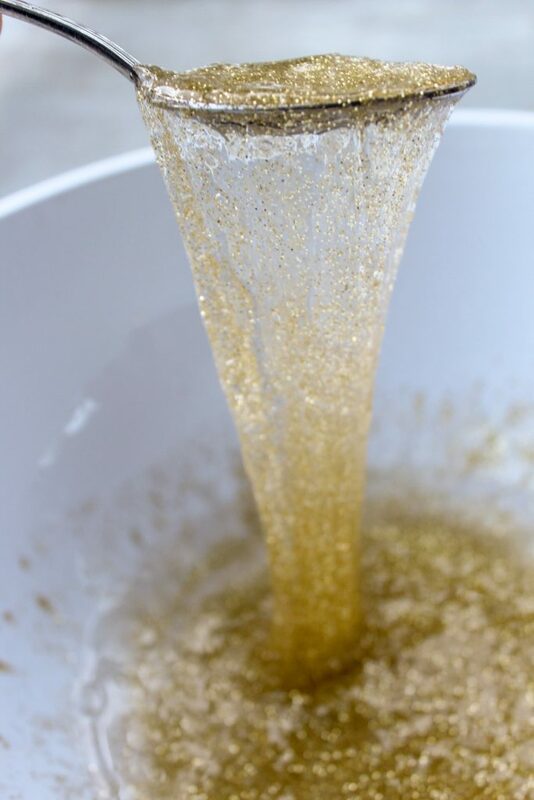 In honour of St. Patricks Day, we made a pot of gold for the slime. We purchased three terracotta pots at the dollar store and painted them with acrylic black paint. Mix equal parts water and clear school glue. The more slime you want to make the more you will need of both. Combine as much glitter as you would like. Mix well. In a separate glass or container, mix 1/2 a tsp of Borax into warm water. The hotter the water, the faster the Borax will dissolve. This makes the activator. 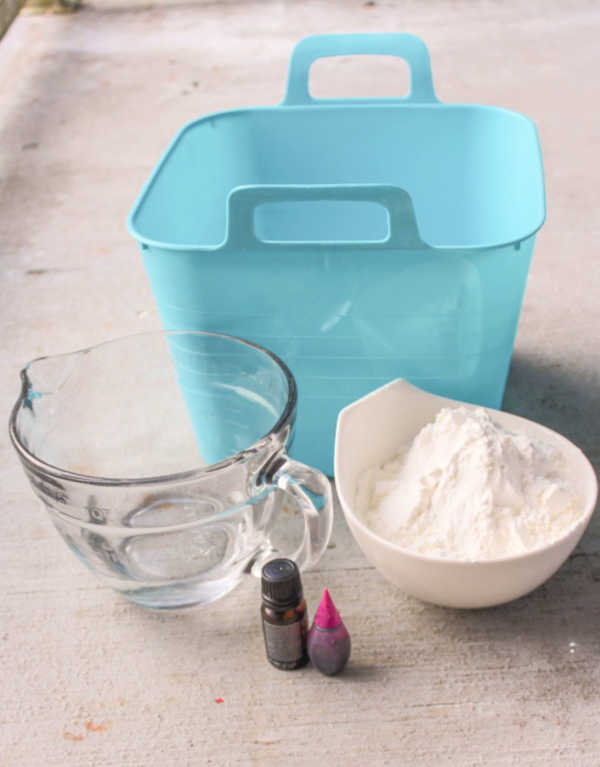 If you don’t have Borax, follow this recipe. Slowly add the activator to the glue-glitter mixture. We added 1 tbs at a time until we reached desired consistency. Unlike white glue slime, if you add too much activator to clear slime, it won’t be stretchy. Remove from bowl, add to the pot of gold and enjoy! My daughter gave this recipe two thumbs up! If you’re worried about slime clean up, click here. This digging for gold edible sensory play set up is perfect as a St. Patrick’s Day activity for kids. Baby-safe edible play is so much fun! Sensory play is so beneficial to kids. 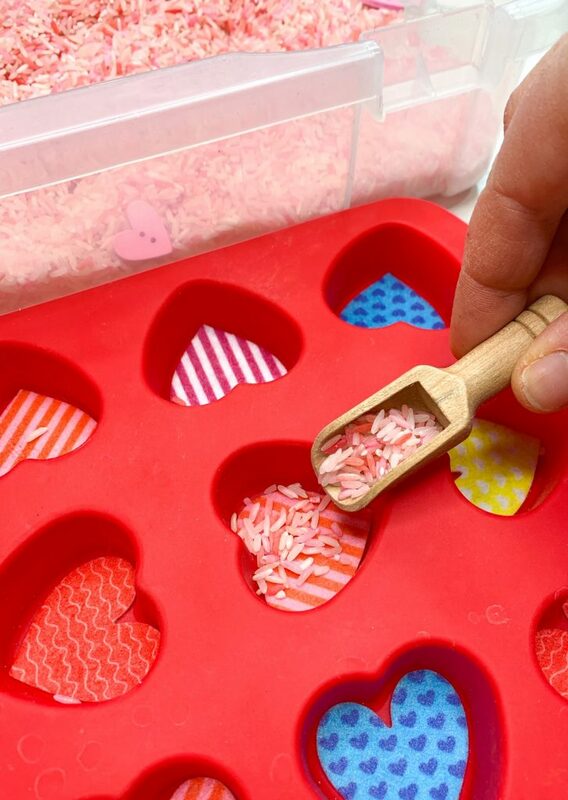 By engaging the senses and exploring materials tactilely, children remember information better and are able to process learned materials with greater ease. This edible sensory play is a fun activity for St. Patricks’s Day with kids, or for any other time of the year as well! 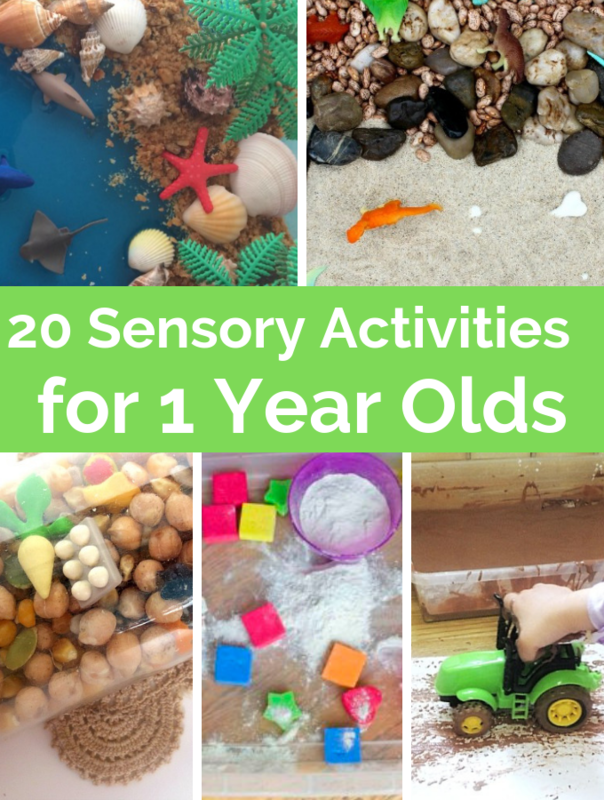 Bonus, it makes great sensory play for 1 year olds and older children alike. This edible sensory play uses pudding as a base, making this a great choice for baby safe sensory play. 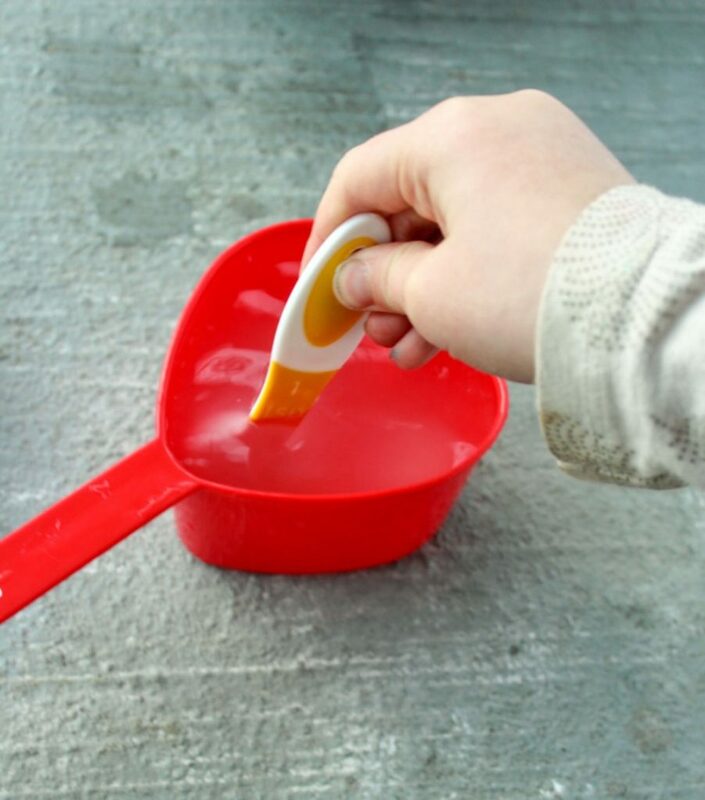 Children can squish and explore the pudding with their hands, get messy, and dig for gold! Make the pistachio pudding according to package instructions. If you have instant pudding mix, this should be fairly quick. However, other pudding mixes might take longer to set, so keep that in mind for the prep of this activity. 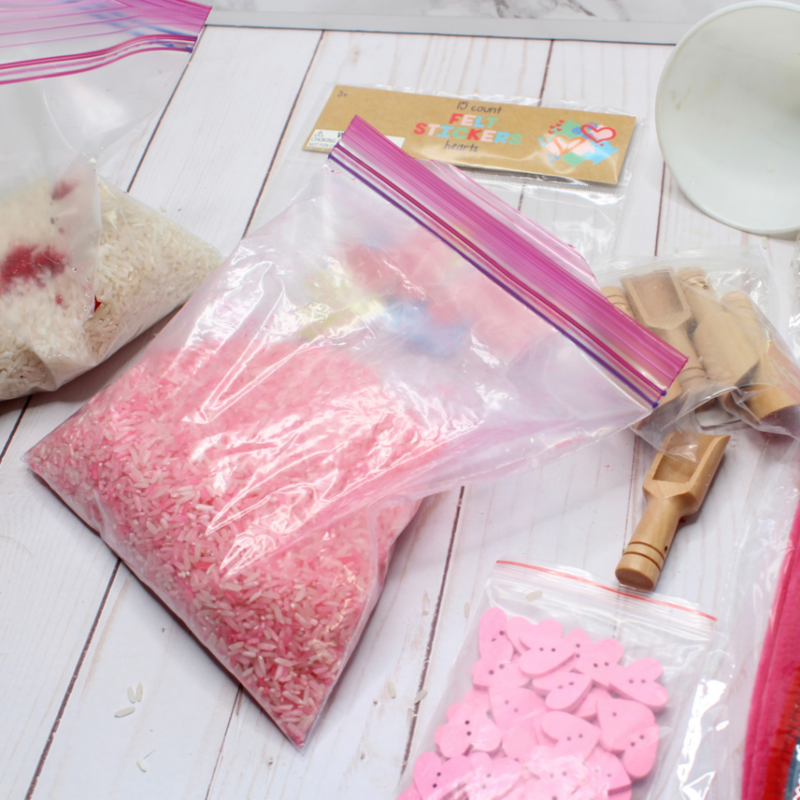 Place plastic gold coins at the bottom of a tupperware bin, and place the bin on top of a towel or plastic tablecloth, this one is bound to get messy! Once set, scoop the prepared pudding on top of the gold coins and spread. This will hide all of the gold coins under the green pudding. Invite the children to go on a gold treasure hunt! They can dive into the pudding, using their hands to squish and move the pudding, uncovering the buried treasure. 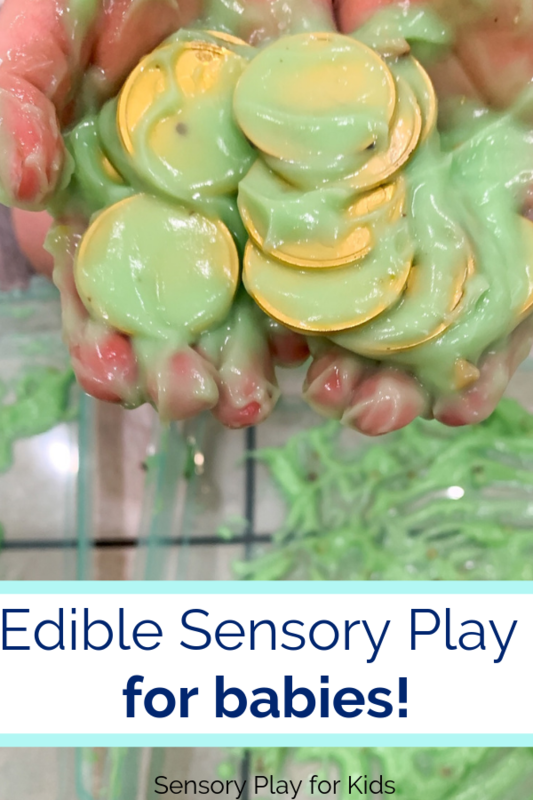 Why is Edible Sensory Play Important? This is such a fun messy play activity for kids! Babies and toddlers (and older children too) like to explore material with their mouths, which is important. A baby’s mouth has more nerve endings than any other part of the body. If they really wants to find out what something feels like, they put it in their mouth! Finding baby-safe material is critical to engaging in sensory play with this age group, which keeps the play open-ended and easier for them to explore. 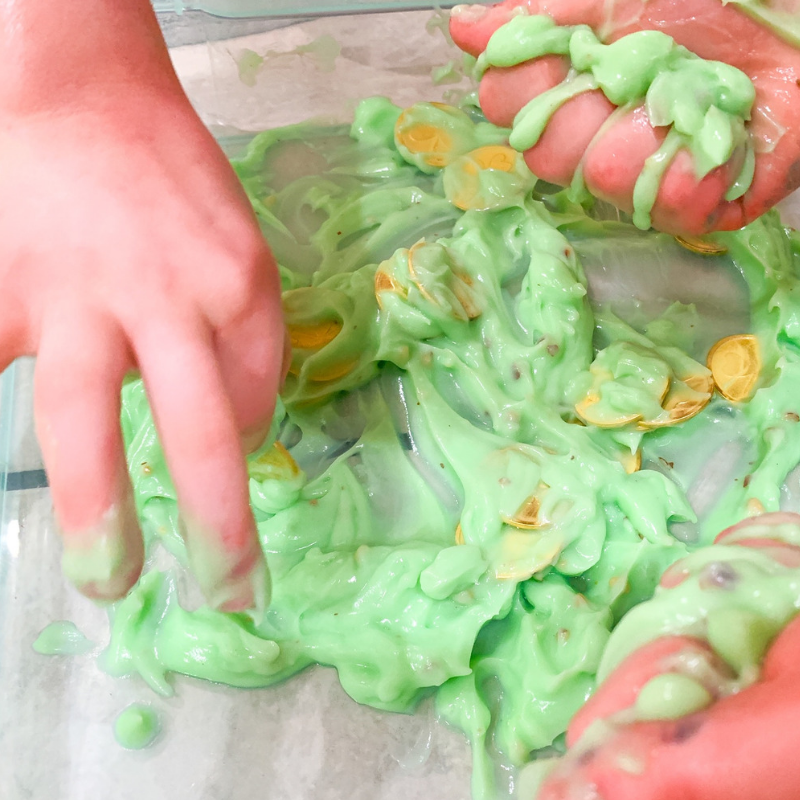 This activity uses pistachio pudding for the edible sensory play base. This pudding does contain pieces of nuts which could be troublesome for 1) very small babies and 2) those with nut sensitivities. As an alternative, use vanilla pudding with green food dye (we like to use the natural food coloring). This activity uses plastic gold coins to dig for. These are fairly large, but could still pose a choking threat if children were to place the in their mouths. Omit the gold for small children where this might be a concern, and simply allow them to play and get messy in the pudding! 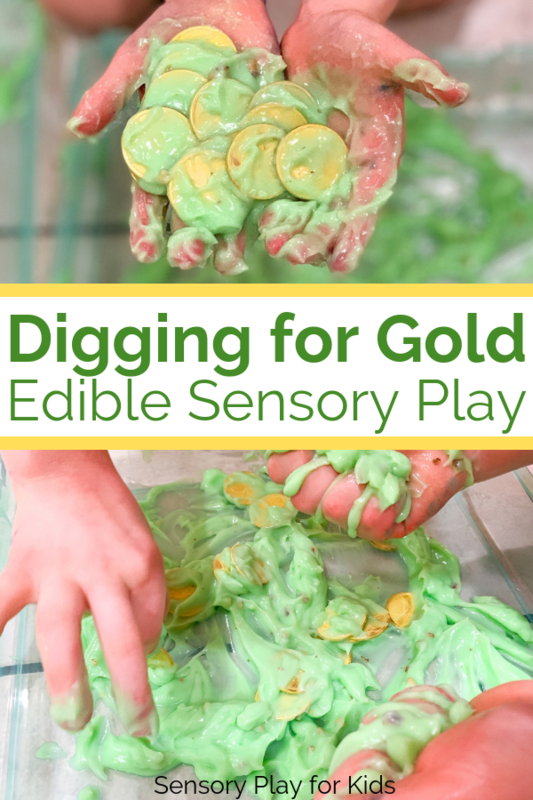 Have so much fun digging for gold in this St. Patrick’s Day edible sensory play activity! Slime is such a fun sensory material for kids. Not only is is fun to play with, it requires math, science and fine motor skills to make. So many amazing benefits! 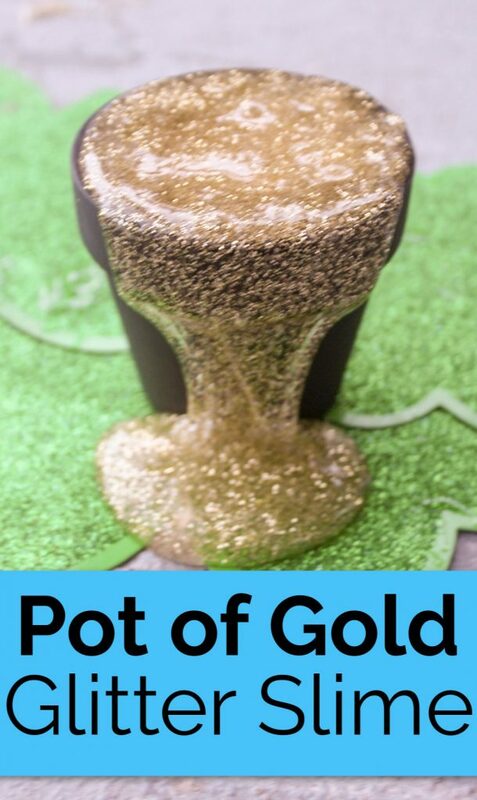 This shamrock slime uses a gold slime base, and then adds some green glitter for color. This slime has a bit of extra activator making it firmer and more moldable, so that kids can create a melting shamrock shape out of it. St. Patrick’s Day is a fun holiday for kids to celebrate. From rainbows to pots of gold and sneaky little leprechauns, children love to find ways to have fun with St. Patrick’s Day. 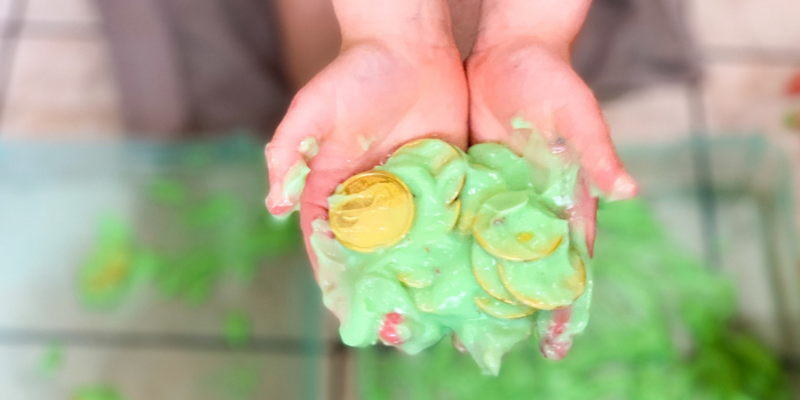 Sensory play is always a favorite of ours, and slime is typically a must when celebrating a holiday. 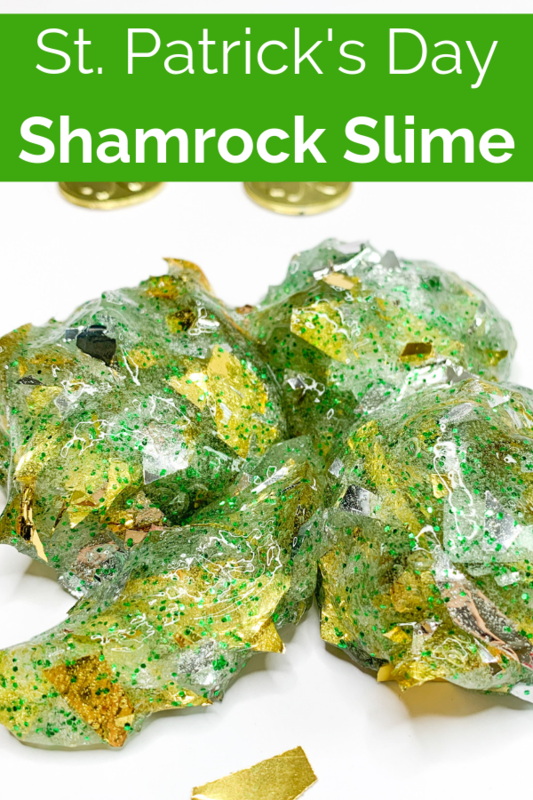 This shamrock slime would be fun to do with a group of kids at a party as well. 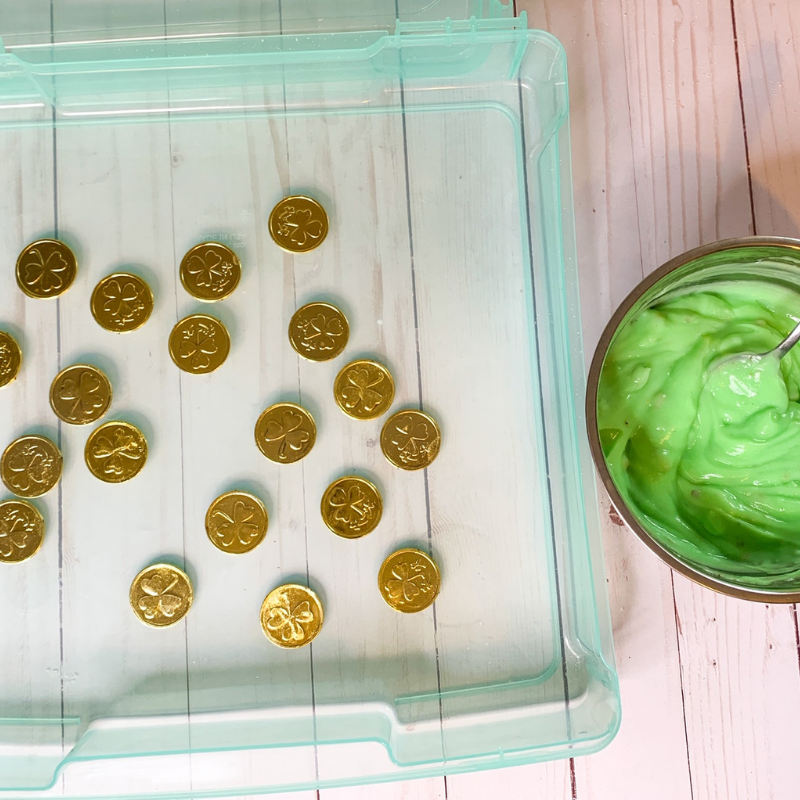 We used this gold slime recipe as a base for our shamrock slime. The recipe in the post calls for clear glue, water and activator to make the clear slime. 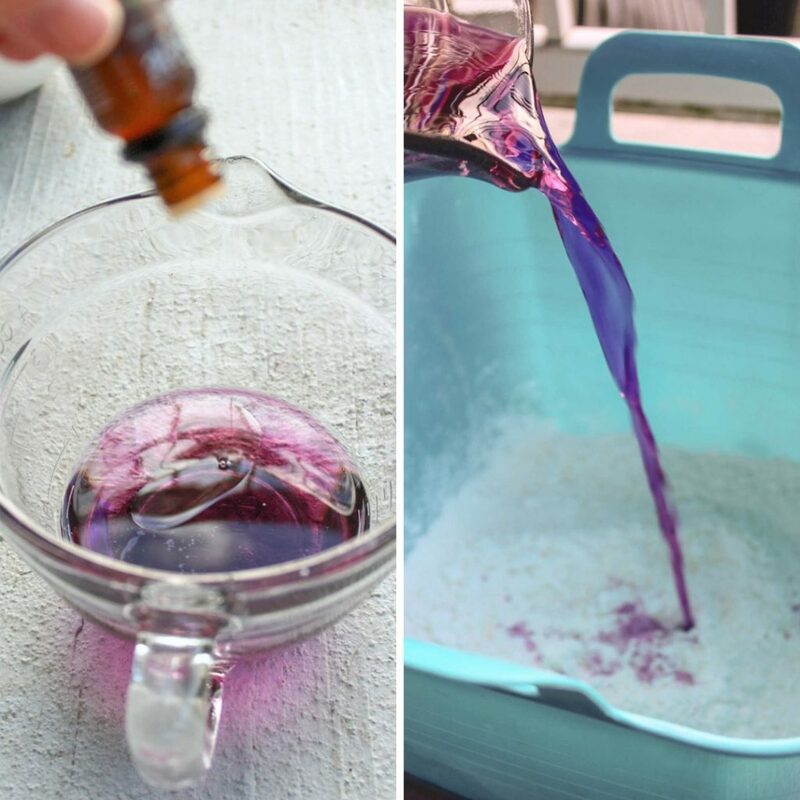 Pre-made activator is an easy way to replace contact solution and baking soda or borax in your slime recipe, and makes slime making a bit more fool-proof for kids. We followed the recipe closely, but then added just an extra 1/2 ounce of activator to stiffen up the slime just a bit. 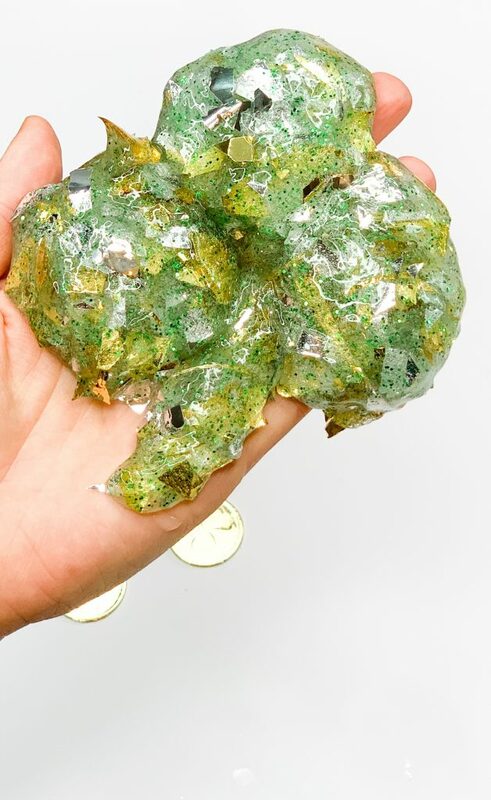 This allows for a more moldable slime for kids to make a shamrock out of! Once you have a nice gold slime that is still clear, add some green glitter! 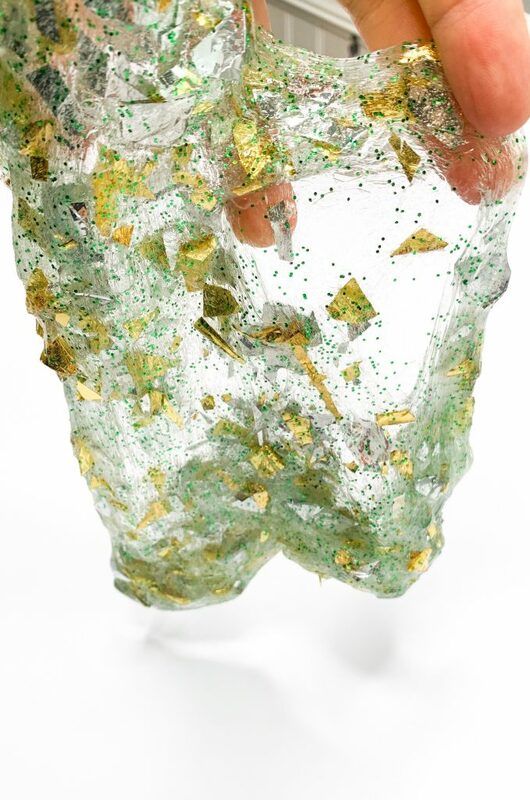 Be generous here, the glitter will transform your slime from clear and gold to green and gold, and will be even more sparkly. Additionally, the slime should be slightly thicker than traditional slime. 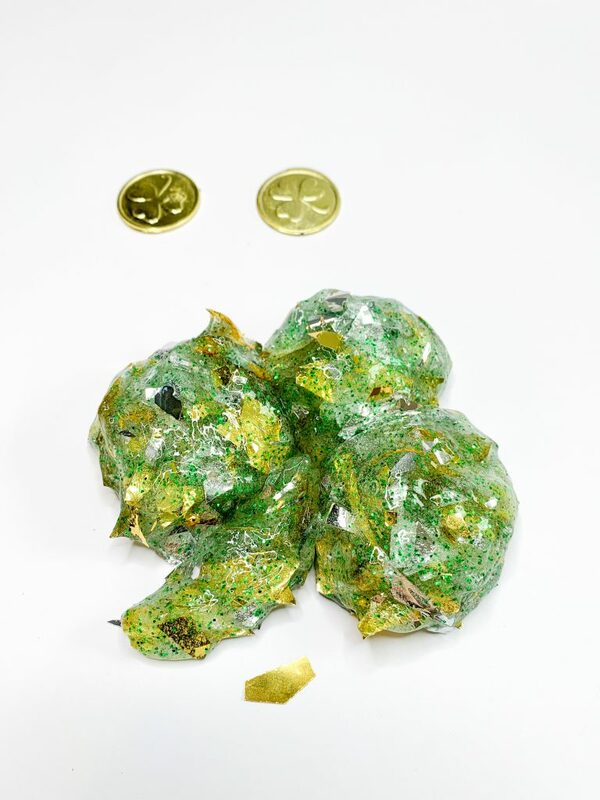 The extra activator plus the gold foil confetti will make for a stiff slime that melts and stretches slowly. Children can mold shamrocks out of their slime by making three balls of slime (or 4 for a lucky four leaf clover!) and adding a slime stem. My children enjoyed making shamrocks out of slime, holding them in their hands, and letting them slowly melt between their fingers before molding them all over again. 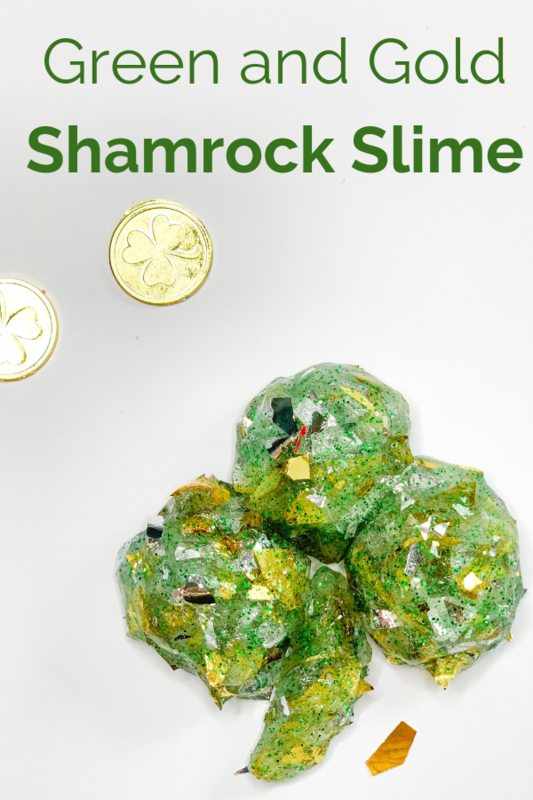 Have so much fun making and playing with this shamrock slime, and celebrating St. Patrick’s Day through PLAY! 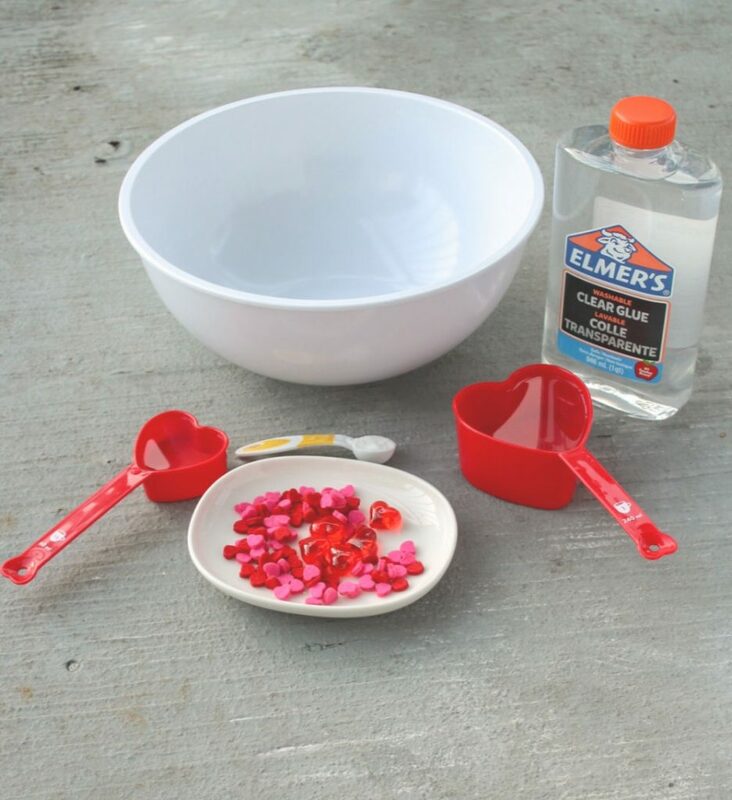 Find out how to make fail-proof clear slime for Valentine’s Day. 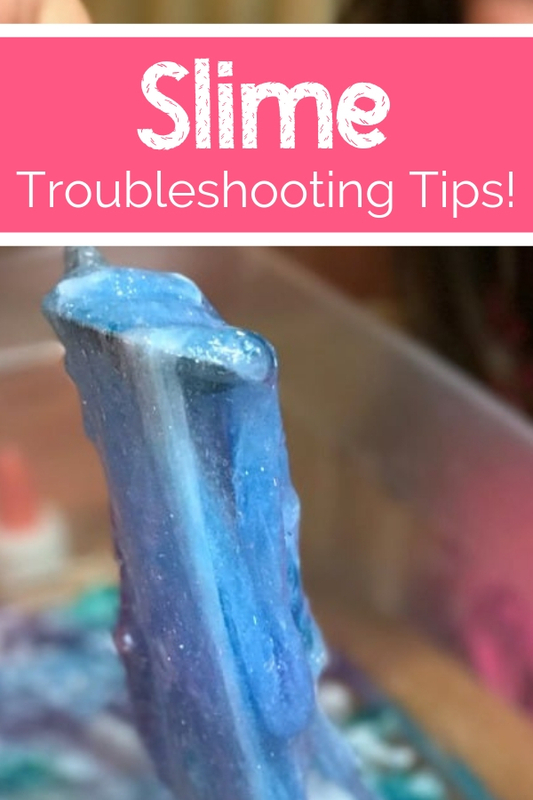 And, also find out how to troubleshoot clear slime fails. My kids are on a major slime kick. My daughter has made her own versions of glow in the dark slime, soft pink Valentine’s slime, and orange slime. We have tried our hand at clear slime before and sadly, it was a miss. The composition is a bit different and therefore it reacts quicker to the activator making it not-so-slime-y. It was almost brittle. 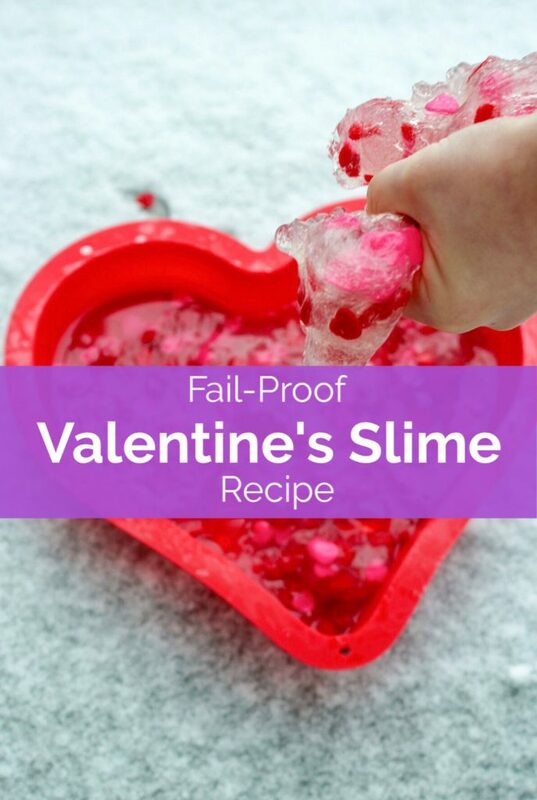 However, with our second snow day this week, I decided to give Valentine’s Day Clear Slime a try. The first thing we did, was watch this video. Use equal parts water to clear glue – you may even want more water than glue. Add your activator very slowly – less is more. If you want to know more about the safety of Borax, watch the video here. Fully dissolve Borax, then set it aside. Dissolve Borax into 1 cup of hot water (this is your activator solution). Then, set this mixture aside. Empty one bottle of clear slime into a seperate bowl. Fill empty bottle of glue with water. Shake the bottle well to remove excess glue. Using a tablespoon, slowly add activator solution until slime starts to form. Note: The slime will be a little sticky at first. This is okay. If it’s no longer sticky there is too much activator. To correct this, break up the slime into small pieces. This will be easy as it will almost be brittle. Add a half cup of water and let the slime sit for about 30 mins. Repeat as many time as necessary until the desired clear slime consistency is reached. Don’t have Borax? Use 1.5 tsp baking soda and 3 tbs of contact solution containing Boric Acid. This will create the same activating solution. Looking for more great slime recipes and more ways to play with slime? Slime is a wonderful sensory tool. 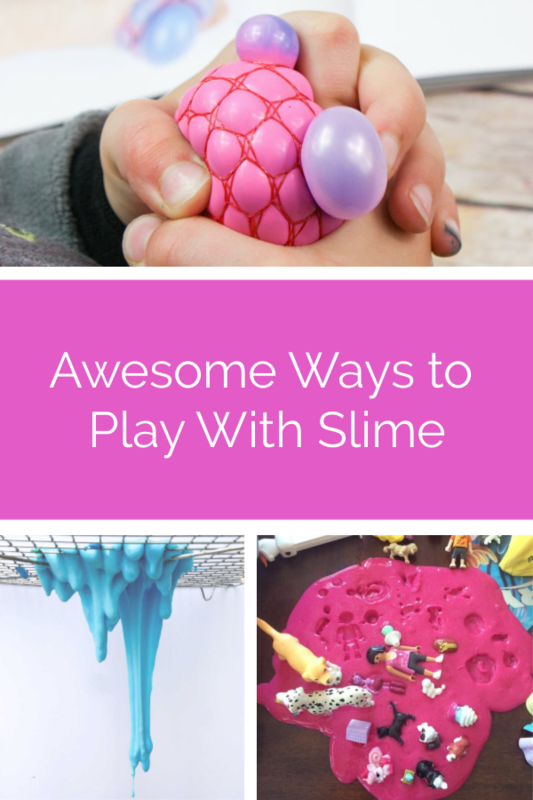 It is squishy, goopy, slimy, sticky and FUN! But, don’t let all of those words scare you. This sensory material, once mixed properly, doesn’t stick to hands or much else. If the slime does manage to make its way onto couches, carpets, clothes, etc…there’s a tip for that below. 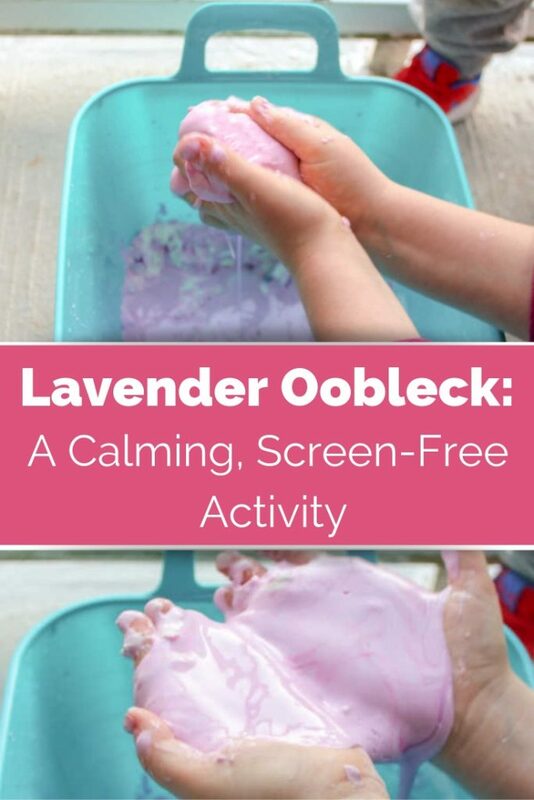 These recipes and activities include fun ways to play with slime for various themes. 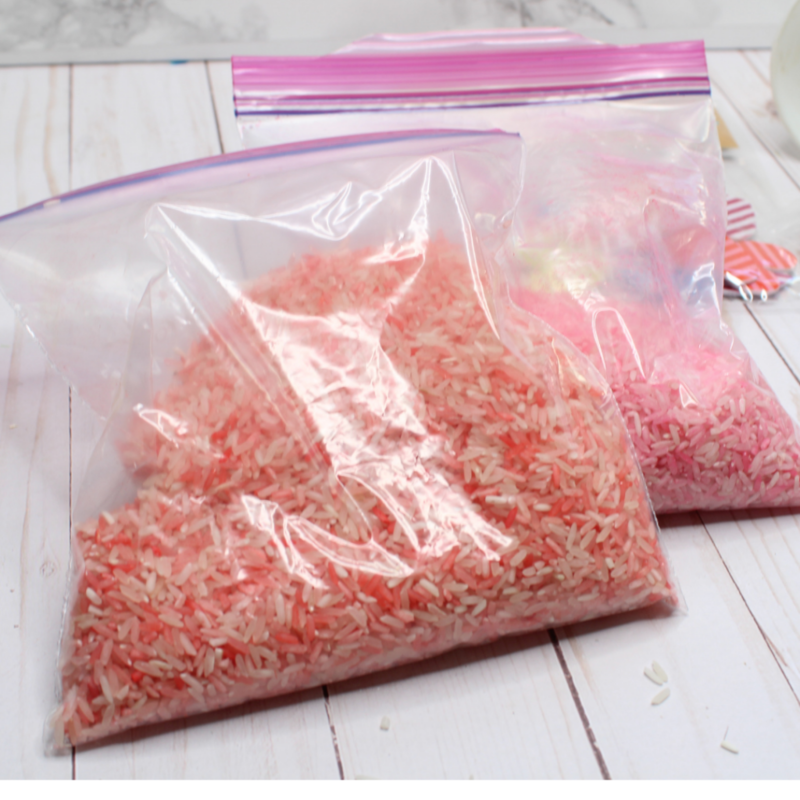 If you want to give slime as a gift, check out how you can make a slime kit for gifting here. 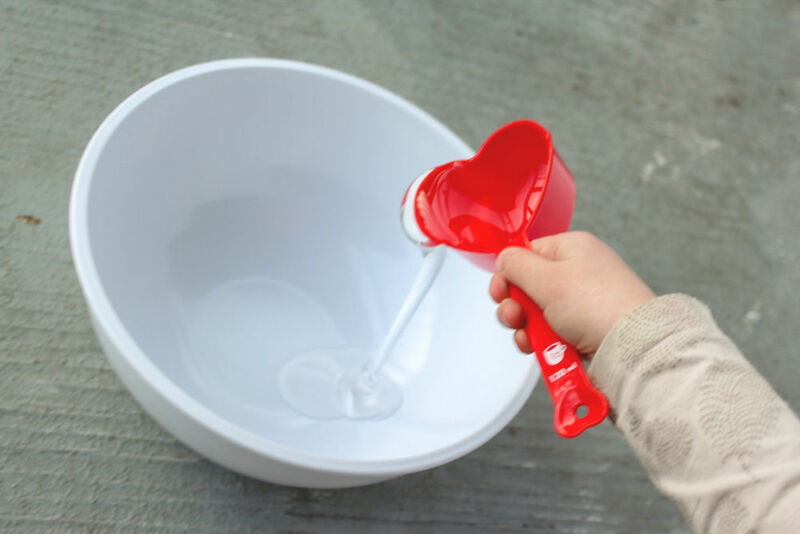 Among these fun slime games and ways to play, are various recipes including slime with borax, cornstarch slime, edible slime, borax-free slime, and more! 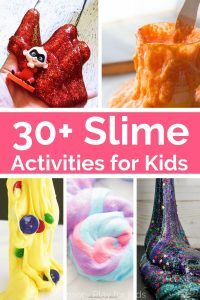 Slime Games, Activities and Recipes! if you get slime in your carpet, on your clothes, etc, soak in white vinegar and scrub, it comes right out! 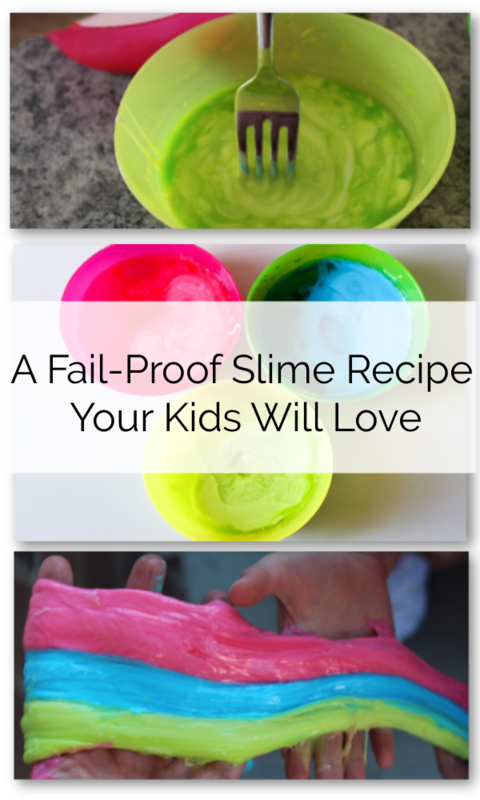 Making and playing with slime is a scientific process, keep this in mind if you are getting frustrated with following a recipe and resulting in a slime fail. Remind kids that they are scientists! 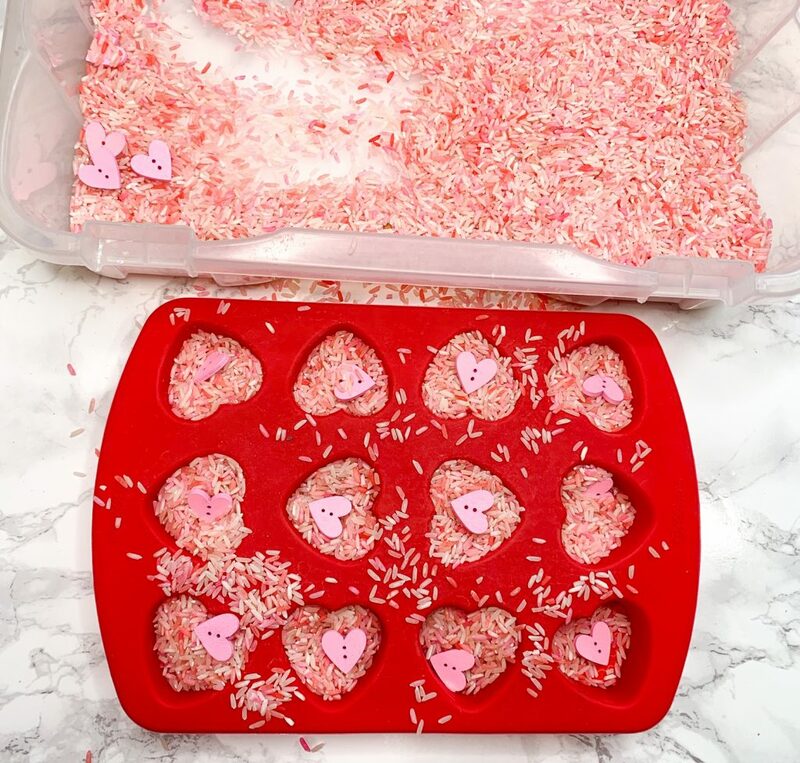 They are mixing different ingredients together, and transforming them into something new and fun! Because this is science, and you are mixing materials, this does need to be done under adult supervision. Enjoy making, and playing with, these fun slime recipes and activities!